Today, the Commission adopted its Annual Report on how it monitors the application of Union law in 2014. The internal market remains Europe's best asset for citizens and businesses who benefit from the timely and correct implementation and enforcement of Union law. The 32nd 'Annual Report on Monitoring the Application of EU Law' reviews the Member States’ performance on key aspects of the application of Union law and highlights the main enforcement policy developments of 2014. The Commission launches infringement procedures when a Member State does not resolve an alleged breach of Union law. The Commission opens infringement procedures when a Member State has not notified the measures transposing a directive into national law within the agreed deadline The Commission can also open an infringement procedure, on the basis of a Commission investigation or a complaint by individual citizens or businesses, when a country's legislation is not in line with the requirements of EU legislation or when Union law is not applied correctly or at all by national authorities. 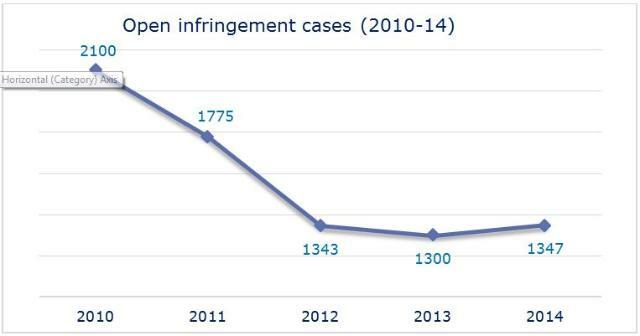 Overall, the number of formal infringement procedures has decreased in the last five years. This reflects the effectiveness of the structured dialogue with Member States via EU Pilot before a formal infringement procedure is launched. It also reflects the Commission's determination to work with the Member States in improving compliance at an early stage and resolving potential infringements quickly, to the benefit of citizens and businesses. The graph below provides an overview of the situation for each Member State, for late transpositions as well asfor incorrect transposition and/or bad application of Union law. 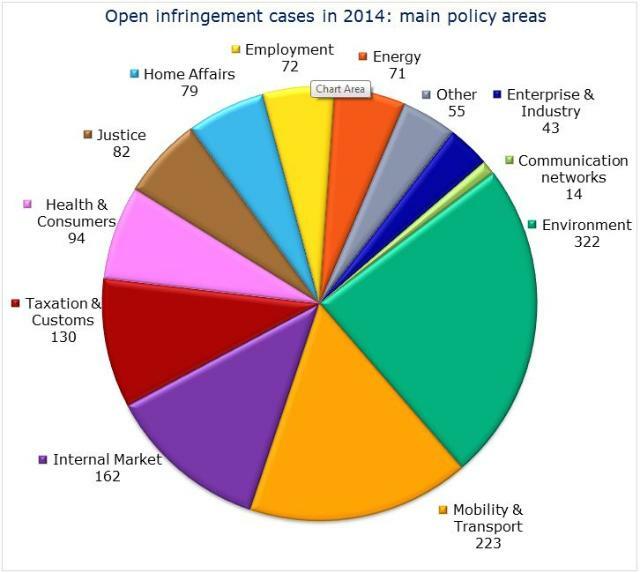 As in 2013, environment, transport and internal market & services remain the policy areas in which most infringement cases were open in 2014. As part of the Better Regulation initiative, the Commission will focus on ensuring the clarity, operability and enforceability of EU legislation. Increased attention will be paid to implementation and enforcement. The Commission is committed to preventing the late transposition of directives by Member States after the agreed deadlines have passed. Delays in transposing Union law prevent citizens and businesses from reaping the benefits of Union law, negatively affect overall legal certainty and unfairly tilt the level playing field in the internal market. Directives on capital requirements, consumer rights, cross-border healthcare or electrical and electronic equipment waste are a few examples of late transposition in Member States. 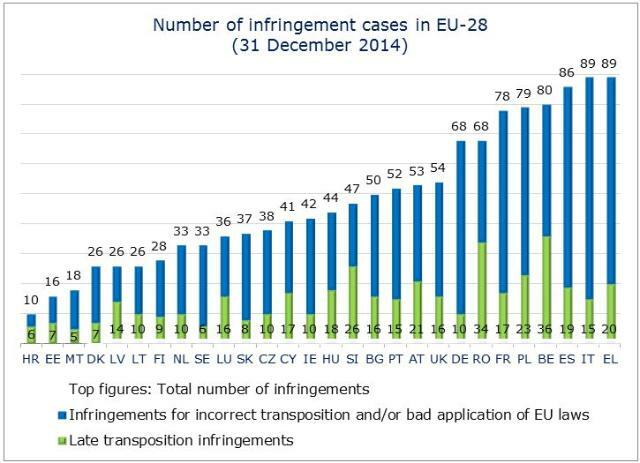 In 2014, the number of late transposition infringement procedures increased by 22% compared to 2013. The Commission continued to assist Member States in implementing Union law by providing for a wide range of tools, such as implementation plans, guidance documents, expert groups meetings and dedicated websites. In cases of failure to transpose a directive within the agreed deadline, the Commission continued to make full use of the financial sanctions system introduced under the Lisbon Treaty. It referred four cases (against Belgium, Ireland and Finland) to the Court of Justice of the European Union requesting financial penalties be applied. Citizens and stakeholders can directly report suspected breaches of EU law through an online complaint form accessible via the Europa portal Your rights. In 2014 the majority of complaints filed concerned employment, internal market and justice. Since 1984, following a request made by the European Parliament, the Commission presents an annual report on monitoring the application of EU law during the preceding year. The European Parliament then adopts a resolution on the Commission's report.